Cedar is the common name for a number of trees in different genera and families, but in a strict botanical sense, the "true cedars" are any of the Old World evergreen trees comprising the genus Cedrus in the coniferous plant family Pinaceae. 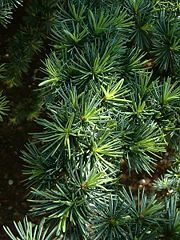 The two to four species of Cedrus are characterized by needle-like leaves, large and barrel-shaped erect cones, winged seeds, and fragrant wood. Other trees known as cedars are also generally coniferous evergreens and include many with scented wood, such as the genera Calocedrus ("incense cedars"), Chamaecyparis, Thuja ("whitecedar," "western redcedar"), Cryptomeria (Japanese cedar"), and Juniperus ("eastern redcedar," "mountain-cedar") in the cypress family Cupressaceae. Other "cedars" include the genera Cedrela ("Spanish cedar") and Toona ("Australian redcedar") in the mahogany family Meliaceae, and Tamarix ("saltcedar") in the family Tamaricaceae. The term cedar applies not only to the trees but also to the wood of any of these species, and especially the light and durable cedarwood of the Cedrus genus, and the aromatic, reddish, durable wood of the eastern red cedar, Juniperus virginiana, the western redcedar (Thuja plicata), and the incense cedar (genus Calocedrus). 4 Uses of "true cedars"
The "true cedar" trees, with their decay-resistant, insect-repelling, scented wood have a legendary use: they were famously used in the construction of King Solomon's temple in Jerusalem. Today, they are popular ornamental trees, and are used for hope chests and modern-day closets. The wood of the eastern red cedar and the western red cedar likewise is resistant to rot and insects, making these popular also for such uses as cedar chests, clothes closets, and fence posts; along with Calocedrus, they are commonly used for making pencils. The fragrant, soft, and durable wood of the Atlantic white cedar, Chamaecyparis thyoides, is often used for boxes, crates, shingles, and small boats. The "true cedars," genus Cedrus are conifers; that is, they belong to the division Pinophyta, also known as division Coniferae, one of 13 or 14 division-level taxa within the plant kingdom (Plantae). The division Pinophyta consists of just one class, Pinopsida, and all living conifers are members of the order Pinales. The order Pinales generally is divided into seven families, one of which is the pine family, Pinaceae, to which true cedars belong, along with pines, spruces, firs, hemlocks, and larches. The true cedars are most closely related to the firs (Abies), sharing a very similar cone structure. They are native to the mountains of the western Himalaya and the Mediterranean region, occurring at altitudes of 1,500–3,200 meters in the Himalaya and 1,000–2,200 meters in the Mediterranean. Cedars are trees up to 40–50 meters (occasionally 60 meters) tall with spicy-resinous scented wood, thick ridged or square-cracked bark, and broad, level branches. The shoots are dimorphic, with long shoots, which form the framework of the branches, and short shoots, which carry most of the leaves. The leaves are evergreen and needle-like, 8–60 millimeters long, arranged singly in an open spiral phyllotaxis on long shoots, and in dense spiral clusters on short shoots; they vary from bright grass-green to dark green to strongly glaucous pale blue-green, depending on the thickness of the white wax layer, which protects the leaves from desiccation. The cones are barrel-shaped, 6–12 centimeters long, and, as in Abies, disintegrate at maturity to release the winged seeds. The seeds are 10–15 millimeters long, with a 20–30 millimeter wing. As in Abies, the seeds have two to three resin blisters, containing an unpleasant-tasting resin, thought to be a defense against squirrel predation. Cone maturation takes one year, with pollination in September-October and the seeds maturing the same time a year later. Cedars are used as food plants by the larvae of some Lepidoptera species including pine processionary and turnip moth (recorded on Deodar Cedar). Deodar Cedar Cedrus deodara. Western Himalaya. Leaves bright green to pale glaucous green, 25–60 mm; cones with slightly ridged scales. 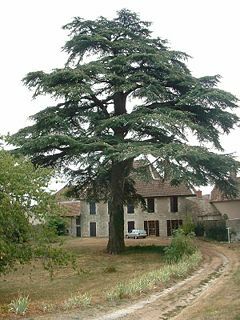 Lebanon Cedar Cedrus libani var. libani Mountains of Lebanon, western Syria and south-central Turkey. Leaves dark green to glaucous blue-green, 10–25 mm. Turkish Cedar Cedrus libani var. stenocoma Mountains of southwest Turkey. Leaves glaucous blue-green, 8–25 mm. Cyprus Cedar Cedrus brevifolia or Cedrus libani var. brevifolia. Mountains of Cyprus. Leaves glaucous blue-green, 8–20 mm. Atlas Cedar Cedrus atlantica or Cedrus libani var. atlantica. Atlas mountains in Morocco and Algeria. Leaves dark green to glaucous blue-green, 10–25 mm. Both the Latin word cedrus and the generic name Cedrus are derived from the Greek kedros. Ancient Greek and Latin used the same word, kedros and cedrus respectively, for different species of plants now classified in the genera Cedrus and Juniperus (juniper). As species of Juniperus are native to the area where Greek language and culture originated, but species of Cedrus are not, and the word "kedros" does not seem to be derived from any of the languages of the Middle East, the word probably originally applied to Greek species of juniper (Meiggs 1982). It likely was later adopted for species now classified in the genus Cedrus because of the similarity of their aromatic woods (Meiggs 1982). Cedars are very popular ornamental trees, widely used in horticulture in temperate climates where winter temperatures do not fall below about -25° C. (The Turkish cedar is slightly hardier, to -30° C or just below). Cedars also are grown for their durable (decay-resistant) scented wood, most famously used in the construction of King Solomon's temple in Jerusalem provided by King Hiram, or Ahiram, of Tyre, Lebanon, circa 1,000 B.C.E. The wood also is used for humbler purposes requiring resistance to weather, such as shakes and shingles. Cedar wood and cedar oil is known to be a natural repellent to moths (Burfield 2002), hence hope chests were made of cedar when available. Cedar is a popular lining for modern-day closets in which woolens are stored. (The similar characteristics of the wood of the New World eastern red cedar, Juniperus virginiana and the western redcedar, Thuja plicata also leads to their common use in cedar chests and lining modern day clothes closets). The use of cedar is mentioned in The Iliad, Book 24, referring to the cedar-roofed or lined storage chamber where Priam goes to fetch the treasures used to ransom the corpse of his son Hector from Achilles. Extensive reforestation of cedar is carried out in the Mediterranean region, particularly Turkey, where over 50 million young cedars are being planted annually. Burfield, T. 2002. Cedarwood oils. Aromatherapy Times 1(55): 14-15. Retrieved December 5, 2007. Christou K. A. 1991. 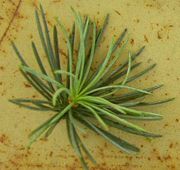 "The genetic and taxonomic status of Cyprus Cedar, Cendrus brevifolia" (Hook.) Henry. Mediterranean Agronomic Institute of Chania, Greece. Frankis, M. P., and F. Lauria. 1993. "The maturation and dispersal of cedar cones and seeds." International Dendrology Society Yearbook 1993: 43-46. Greuter, W., H. M. Burdet, and G. Long. (eds.) 1984. Med-Checklist – A critical inventory of vascular plants of the circum-mediterranean countries. ISBN 2827701510. Güner, A., N. Özhatay, T. Ekim, K. H. C. Başer. (eds.) 2000. Flora of Turkey and the East Aegean Islands 11 (Supplement 2): 5-6. Edinburgh University Press. ISBN 0748614095. Meiggs, R. 1982. Trees and Timber in the Ancient Mediterranean World. Oxford: Clarendon Press. ISBN 0198148402. Meikle, R. D. 1977. Flora of Cyprus, (volume 1). Kew, London: Bentham-Moxon Trust, Royal Botanic Gardens. This page was last modified on 20 January 2017, at 21:16.